A.J. had a very long, busy weekend. Greg’s niece invited him to walk in the Relay for Life in Richland, WA Friday night/Saturday morning, and he really wanted to go. The relay is a walk around a track that goes all night, from about 7:00 PM to 8:00 AM. His niece said she’d be there walking all night, and Greg insisted he’d out-walk her. (Technically, the “relay” part means you take turns walking, and your team walks all night. But Greg and his niece both insisted they were each going to do the whole thing on their own.) We’d be staying the weekend with Greg’s mom Lucy and his brother Chuck. We brought A.J. with us, but no dogs are allowed at the track so A.J. was going to have to stay with Lucy and Chuck. We weren’t sure how A.J. would handle that. As it turned out, he did just fine. We arrived late in the afternoon. A.J. was pretty excited, of course. Shortly after we got there Chuck showed A.J. the doggie door. It took him about two minutes to figure it out. He had a blast running in and out that door for the rest of the weekend. He also quickly discovered the swimming pool, but unfortunately he didn’t realize it until it was too late. The cover was still on the pool, so he didn’t know there was deep water there. He stepped onto the cover and went in. I started pulling my shoes off because I was afraid he’d get all caught up in the cover and not be able to swim out. But he managed to flail his way to the edge, where Greg grabbed his collar and pulled him up. So his first experience with the pool didn’t go very well, he was a little panicked. Chuck made dinner Friday night, and A.J. learned quickly that it pays to hang out with Chuck while dinner is being prepared. After dinner Greg and I left to go to the relay. We had decided that Greg would walk all night, but that I would be back by midnight so I’d be there overnight for A.J. We didn’t want anyone to have to put him in his crate and risk him crying all night, and we definitely didn’t want to give him the run of the house while everyone was asleep in their rooms. So I would be back in time for Chuck to go to bed, then I’d get up early and leave A.J. with Lucy when she got up and I’d go rejoin Greg. I had walked 40 laps by about 11:00 PM (Greg had walked 44), so I decided to go ahead and leave. I got back to the house around 11:30. Check told me that when we left, A.J. just stared at the door for a long time. Then he’d leave for a little while, but he went back to stare at the door a few times. He also cried a little, but Chuck said it wasn’t too bad. I hope not. But he did continue to use the doggie door, he went in and out on his own several times during the evening. Overall he did just fine. I talked to Chuck for a while (and ate a piece of chocolate cake), then I went to bed. A.J. went right into his crate and we both slept well. I set my alarm for 5:30. When it went off A.J. whimpered and I got up and let him out. We went on a short walk, and when we came back Chuck was already up, thinking he needed to be up to watch A.J., or to go get Greg, which he offered to do. But I fed A.J., ate a little breakfast, and headed out by 6:15. By then Lucy was also up. When I got to the track Greg was still walking, but barely. He had three laps to go to reach 120 laps, 30 miles. I walked the last three laps with him, at which point he was done. His niece was packing up then anyway, not waiting for the closing ceremonies. It had been a long night for all. We got back and A.J. was happy and doing fine. He loved the backyard, he could run so much farther than he can at home. Two of Lucy’s great-granddaughters, Avah (8) and Scarlett (2) were going to be coming over, so Lucy and Chuck took the cover off the pool. I sat on the edge of the pool with my legs dangling in while A.J. ran around the yard. At one point he came over and I kicked the water up with my feet. A.J. went crazy. There was also a toy floating in the pool that he was interested in. 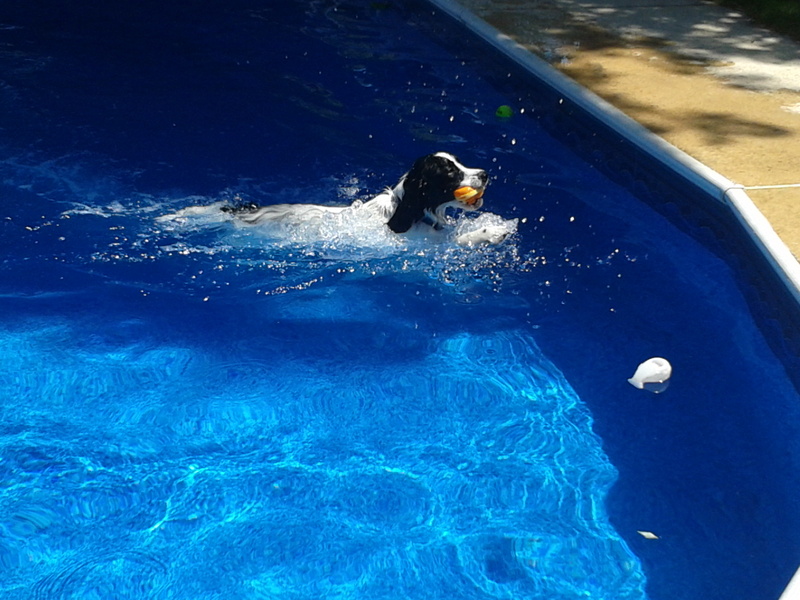 As I splashed, he started barking and running around the pool and carrying on. He got all the dogs in the neighborhood worked up. He was completely crazy. When the toy got close to the edge he kept leaning into the pool trying to reach it. Finally, inevitably, he fell in. A.J. trying to get to the toys in the pool. He panicked a little at first, and I had to really yell at him to get him to come to me at the steps where he could climb out. After he came out, Avah started taking all the pool toys and throwing them into the pool. A.J. had to go through his barking and running around again before finally jumping into the pool to get another toy. He did finally just jump in one time. A few other times he went to the steps and eased his way in. But even after he’d figured those things out, he’d still go back to running around barking frantically at the pool toys before finally going in to get them. But he was having a great time. And he wasn’t satisfied until he had all the toys out of the pool. A.J. 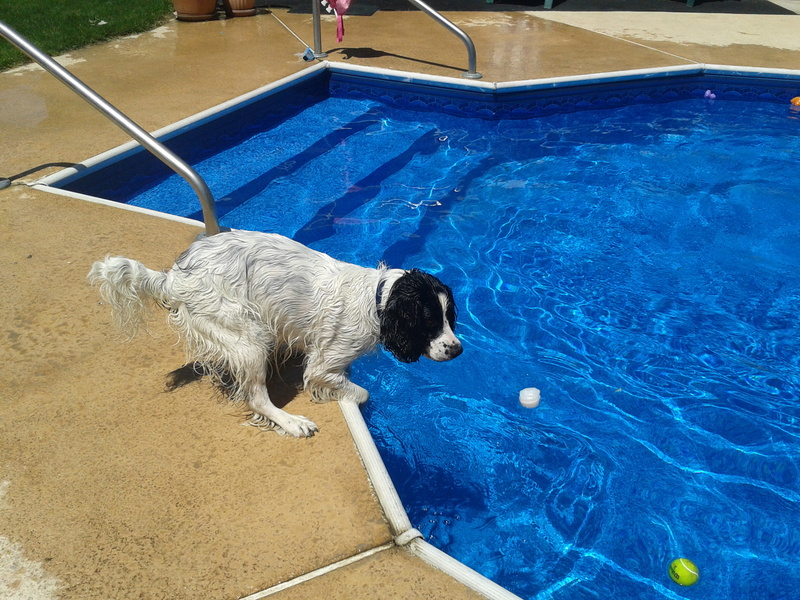 retrieving a toy from the pool. I went running out of the bedroom and my feet hit a big wet spot on the carpet. A.J. had climbed out of the pool and come running into the house through the doggie door to find me. He left a trail of wet carpet behind him. Thankfully Chuck thought it was pretty funny. I took A.J. back out and dried him off. Throughout the day A.J. did great with the kids. He cozied right up to Avah immediately and she sat and petted him nicely. He scared Scarlett when he came out of the pool and shook all over her. After that she went running for the house anytime she saw A.J. get into the pool. Later in the afternoon, Chuck and Lucy decided to take the girls and their dog Sky for a walk. They were going to take A.J., but I wasn’t sure how he’d behave with someone else walking him. So I went along with them. A.J. did great, and everyone was remarking on how good he was. Then he saw a cat. I had to give him some good corrections because he lunged and ignored me. After that he was good again. Sky lunged at the cat too, but a fat little Dachshund doesn’t pose as much of a problem when he lunges. So A.J. had a very fun and busy day on Saturday. At the end of the day he went into his crate and we went to bed. In the meantime, after being up all night Friday, Greg had spent most of the day on the couch dozing in and out. He hadn’t really slept all day. So when A.J. started crying at 5:00 AM I got up and took him out into the living room. I grabbed a blanket and he laid on the floor quietly next to me while I went back to sleep on the couch until Lucy got up around 6:00. I waited for Greg to get up to take A.J. for a walk because his leash and collar and my clothes were in the bedroom and I didn’t want to wake Greg. When he got up Lucy said she was taking us to breakfast. Greg said he’d take A.J. on his walk while I showered. Lucy said she’d go with him. She also decided she was taking A.J; there was no stopping her. I put his collar on him and she came walking over with the leash with no intention of handing it over. They had a nice walk, Lucy hanging onto the leash the whole time. At one point in the walk A.J. saw some quail and started to go after them. Greg reached over and grabbed the leash and gave him a good pop. After that he walked nicely for Lucy. I finished my shower before they got home and did a quick sweep of the house. I was trying to decide whether we could leave A.J. free in the house or if I was going to have to crate him. I realized there really wasn’t much in the house that would need moving. When Greg and Lucy got back, we all decided A.J. would have the run of the house. I closed off the bedroom doors, moved a couple of stuffed animals, and got everything on the kitchen counters out of reach. The one thing I forgot was Sky’s food, which was up on the dryer but still within A.J.’s reach. And that’s the one and only thing A.J. got into. Overall he was a very good boy, I was really proud of him. The only things he really hurt all weekend were a couple of plants. He completely uprooted a rhododendron when he charged through it. He had a great time in the pool and chasing squirrels and running through the doggie door. A.J. 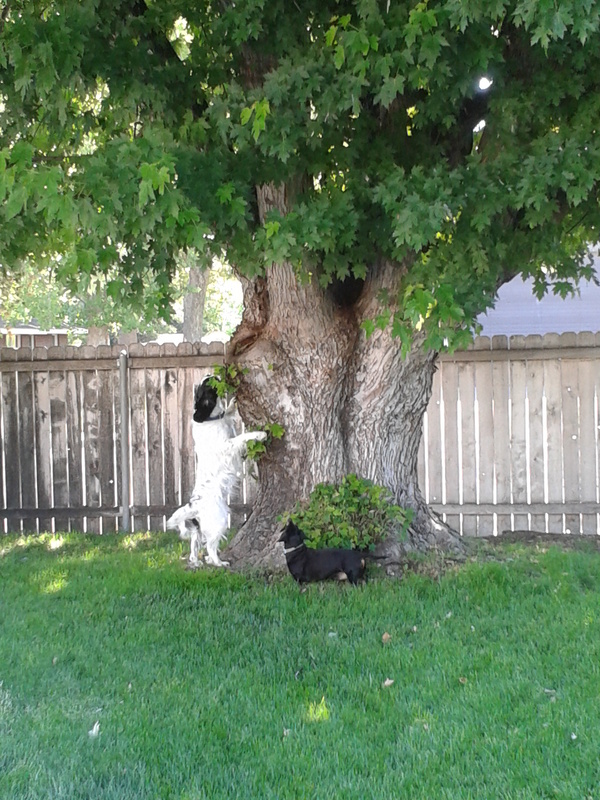 chasing squirrels while Sky watches. The one and only down side to the whole weekend was that on Saturday morning I saw that A.J.’s foot was swollen. He’d started licking at it Wednesday night and I tried to find something, but I never did. So he’d continued to lick at it, and Saturday it was all swollen and I made an appointment with the vet for Monday morning. We went to the vet this morning. We got there just as they opened. There were two other dogs waiting. We walked in right behind them, and A.J. stood nicely beside me as we waited our turn. When the tech came out she looked and said it was probably cheatgrass, which is what I had thought. She put him on the scale, and he weighed 48.5 pounds. My little boy has trimmed down! Yay! She said Dr. Baker would probably be seeing him, or maybe Dr. Frost. I told her Dr. Frost needed to see him to see how good he was being. (Dr. Frost is the vet who saw A.J. throwing one of his major tantrums, and who advised us on options when I was at my wits end.) That’s when the vet tech remembered how awful A.J. had been and was amazed at how good he is now. When we came back to get A.J., Dr. Frost came out and the first thing he said was “Well done.” He was pretty impressed. A.J. was really good the whole time he was there, and he really seemed like a completely different dog. Dr. Frost said “Do you remember telling me ‘I just want to be able to walk him down the street!’? Do you remember that?” Yes, I remember that. And now I can take him anywhere. He’s a great pet now, and I’m training him to be even better so he can be a therapy dog. Dr. Frost was amazed and very pleased. And I am very, very proud of my little boy. He’s home now with a sore foot, antibiotics and painkillers. He had a very tiring weekend, and he’s proven himself to be a wonderful little dog. I probably won’t be thinking that when he comes to wake me up at 5:00 AM tomorrow morning, but tonight he’s great. 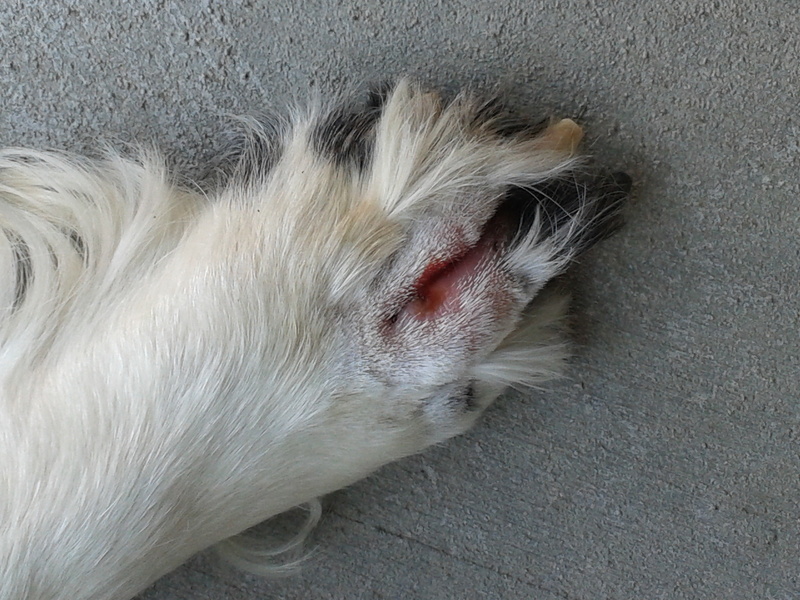 Another cheatgrass wound for A.J.